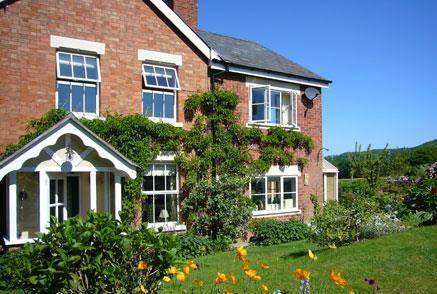 Weobley Cross Cottage bed and breakfast is ideally placed for visiting the towns, villages and countryside of Herefordshire and Worcestershire. It is also within reach of Cheltenham Race Course for the annual Gold Cup horse racing event. Weobley Cross Cottage Bed and Breakfast is well placed for visiting Malvern, Ledbury Hereford and Worcester, and walking on the Malvern Hills. The Ordnance Survey maps Malvern Hills and Bredon Hill No. 190 or Worcester and The Malverns Landranger Map 150 are ideal for planning walks on the Malvern Hills and surrounding area. It's an ideal location for walking or cycling in and around the Malvern Hills, exploring the Wye Valley and Forest of Dean, visiting the many local gardens and National Trust properties, quaint English villages and local market towns. The b&b is 4 miles from Great Malvern and 7 miles from Ledbury. 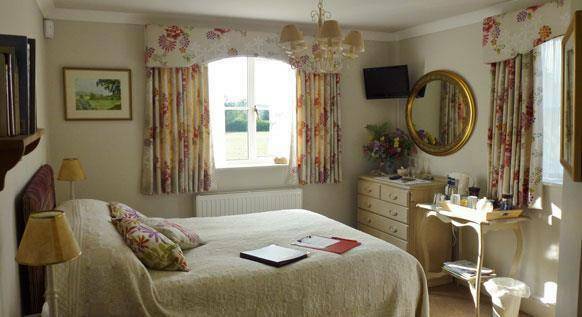 Weobley Cross b&b also offers ideal accommodation for Malvern Flower Shows at the Three Counties Showground and The Ledbury Poetry Festival. Set in the idyllic countryside of Mathon, set in the picturesque and peaceful countryside west of the Malvern Hills where Worcestershire meets Herefordshire, Weobley Cross Cottage offers b&b accommodation near Malvern for short breaks, weekend breaks and longer stays. On arrival at the this luxury b&b you will be offered tea and cake/biscuits in the conservatory then shown to your beautifully furnished ground floor bedroom. 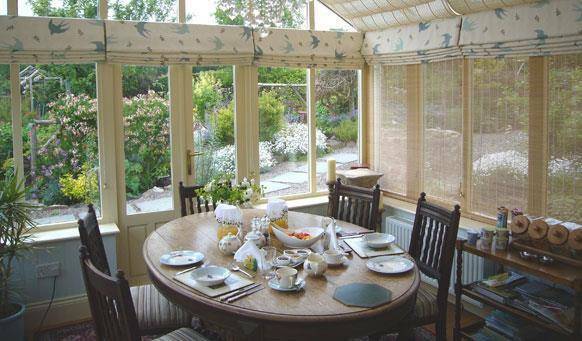 Breakfast, served in the conservatory overlooking the garden, includes tea/coffee, fruit juice, freshly prepared fruit, yoghurt, cereals, toast and homemade preserves as standard, plus a full English or variation. Eggs, bacon and sausages are locally sourced. We are delighted to have been awarded a "5 - Very Good" food hygiene rating by the Food Standards Agency. The Garden Room, situated on the ground floor, has two windows with stunning views of the cottage gardens and hills beyond. This double room is light and pretty. An Interior designer, Anne has decorated and furnished the room to a high standard with quality and contemporary soft furnishings. The double bed is firm and comfortable for a good night’s sleep. The ensuite shower room is well equipped with efficient and modern facilities. Complimentary toiletries are supplied as well as plenty of quality towels. The central heating radiator is adjustable and the ensuite has a heated towel rail. South End Bed and Breakfast Accommodation situated on the ground floor, this room has a large window which overlooks South End Lane and the kitchen garden to the fields beyond. 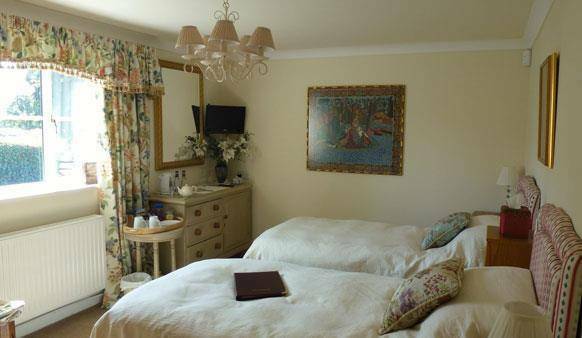 This twin bedded room is decorated and furnished to a high standard with quality soft furnishings in a traditional style. The twin beds are firm and comfortable for a good night’s sleep. The ensuite shower room is well equipped with efficient and modern facilities. Complimentary toiletries are supplied as well as plenty of quality towels. The central heating radiator is adjustable and the ensuite has a heated towel rail. This room is slightly larger than the Garden room and can accommodate a camp bed for a child. Both the Garden Room and South End are equipped with flat screen TV, radio alarm and free Wifi. Both rooms are accessed via a lobby which has its own front door and porch and information table with brochures of local attractions, events and places to visit.